And I've been chosen to sample them. A few weeks back I was contacted by the advertising firm, Mr Youth, and asked if I would taste test some Tim Tam cookies. Prior to this I had never heard of Tim Tam cookies, but once they described them of course I agreed. Chocolate wafer cookies filled with chocolate and covered in chocolate; I couldn't possibly turn the offer down. So what exactly are Tim Tam cookies and why haven't you ever heard of them? Believe it or not there are around 35 million packages of these cookies sold each year. Produced by the Australian baking company, Arnott's, Tim Tams are the #1 selling chocolate cookie in Australia. Ilovetimtamcookies.com describes these treats as: "the most irresistible chocolate cookie." "Crisp cookie layers lovingly covered with rich chocolate fudge, and filled with smooth chocolate crème that will slowly melt on your tongue in decadent delight." My sample cookies arrived this past Saturday, just in time for me to have a mid-afternoon snack. I tore into the package and savored each bite. Tim Tam cookies are pretty good. They remind me of chocolate coated graham crackers with a silky mousse filling. So if you'd like to experience these Australian cookies for yourself, Pepperidge Farm has brought them to the US for a limited time. You'll find them exclusively at Target until March, 2009. A blogger friend once sent me these and I fell in love!..with the timtams. Chocolate fudge and cream, how can you go wrong? They look yummy! You should try biting a little of each end off and then dunking them in milk and sucking the milk through them like straws. You can also do this with coffee as well. OOO....you are definitely a bad influence. I am heading to Target tomorrow! Thank you for checking out my blog! I am excited to read more of yours! I tried the caramel version of these, I thought they were really good! OH lucky u...love chocolate and anything tht has choc...yummy! I so miss these ! 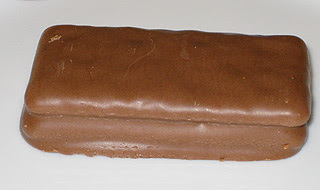 The ad used to say 'A Tim Tam is better than a man' and it wasn't far wrong! I quite literally lived on Tim Tams when I was traveling around Australia years ago. Sadly, this was because they were one of the few enjoyable foods available in the majority of the country. I'm sure australians and autralophiles will pillory me for that statement, and I had some excellent food in Sydney (and around) and Melbourne, but elswhere it was nearly as bad as in my native UK. We called several Targets before we found them in Oro Valley (north of Tucson). My secretary picked up several packages on the way to work. Really, really good! Thanks for the tip. I fell in love with these cookies on a trip to Australia and after years of missing them, I found them in the international aisle at Wegmans! If you are a tea lover like me, you can do the "Aussie" thing by biting off both ends and using the cookie like a kind of straw. So messy, but SO delicious!! awesome...try biting off the ends and sucking milk through...ahh yep heaven!